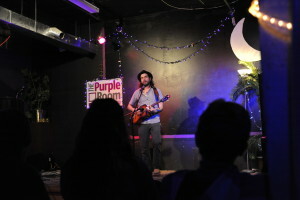 Beginning in March 2013, the Purple Room — located in the heart of the Exchange District — become a creative “home” of source for countless musicians, comedians, dancers, poets, and fans alike. With basically no budget and a dream, slowly but surely Winnipeg’s “Best New Thing” (The Uniter, December 2013) added some touches that made it look and feel like a real venue and theatre, while never losing the rough-around-the-edges charm that made it feel so comfortable. It grew from a space mostly used for rehearsals into a venue hosting some of the best young and established music and comedy acts from Winnipeg (and across the country), along with regular blues dances, art shows, video dance parties, and a 24-hour “Wonderful Christmastime” charity fundraiser of insanity. During its first 2+ years, Frame Arts Warehouse was not only a physical home to this weird creative space, but also a significant part of its identity. The creative energy of a building full of artists most definitely fuelled the artistry on stage. Unfortunately, as the space grew from a largely rehearsal room into a venue booked many nights of the week, it became apparent that certain amenities were just not available within the confines of 318 Ross Ave. The Purple Room is now in the process of securing a new location in the exciting East Exchange, adjacent to the city’s theatre district as well as a number of exciting new initiatives that promise to revitalize the neighbourhood (and we hope our project is one of those initiatives)! Our plan with this move is to provide a slightly larger (but still intimate), fully accessible space, with amenities that weren’t available in our former space. Along with this will come the ability to host more prominent and more interesting events — we want to host more theatre, dance, and comedy to go along with all the great music that made the Purple Room one of the best live music venues in town. However, one thing we absolutely don’t want to do is lose the “weirdness” from our first home. There was something special about the room at the back of Frame Arts Warehouse, and our #1 goal is to try — as organically as possible — to recreate that feel in our new home. While we get everything in order behind-the-scenes, we’re continuing to operate our weekly CaRaVaN Open Mic & Open Stage — as well as monthly fundraiser shows — out of the Dragon Arts Collective. We’re also producing the odd show and event around town in various other venues and spaces. So what are we actually building? The Purple Room will be a full-service performance venue with a seating capacity of 100, and equipped with professional sound and lighting. The space will be available for rent by local and out-of-town artists of all types, and we will also produce events in-house. We will be open 7 nights a week. The Purple Room will also feature an eclectic destination café offering our patrons an assortment of beverages – beer, wine, bottled sodas and juices, coffee, and teas. We plan to create a diverse hot beverage menu, including loose leaf teas which customers can mix and match; and coffee served in french press pots to ensure optimal flavour. The small bites offered will be sourced from local suppliers, and will also include an assortment of pre-packaged convenience foods such as chips and chocolate bars. Our new space will also house small rehearsal and screening rooms, available to rent and also hosting unique events and workshops. 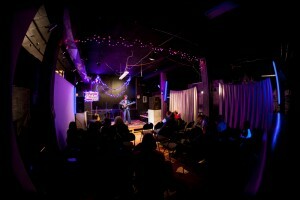 The Purple Room has developed a unique personality thanks to its patrons and artists. We will continue to rely on our patrons’ and artists’ input to grow and evolve the atmosphere and choices offered. Winnipeg is very supportive of its arts and culture, and is recognized across Canada and abroad for this. While there are now a good number of wonderful smaller music venues and rentable theatre spaces, none truly combine the benefits of both. What the new Purple Room will bring to Winnipeg is a space capable of hosting musicians of diverse genres, spoken word artists, dance, theatre productions, comedians, and improvisers of all levels, with all the amenities of larger spaces yet the intimacy of a small black box theatre. We want to help facilitate a sense of culture and bonding within the Winnipeg arts community. The Purple Room is founded by true lovers of the performing arts: we’re musicians, comedians, actors, filmmakers; we’re active supporters of local music, comedy, film, theatre, dance, poetry, storytelling, and more. In our new home, we will continue to provide an accessible, safe, and nurturing creative space to local and touring artists and their audiences. We strive to support and produce a diverse range of events in a unique and intimate atmosphere that fills the growing need for a multi-purpose cultural performance space that is affordable and accessible to all.